The Queer Eye star wants you to vote — and dig deep for some understanding. Five weeks from the 2018 midterm election, it feels like the stakes have never been higher — particularly for LGBTQ citizens, as issues like "religious freedom" and gender identity become explosive talking points for candidates fighting for control of the House and Senate. With a recent poll suggesting that only 28 percent of young voters are certain they'll turn out to vote, it's easy to feel anxious about the results. To counter that anxiety, we're highlighting people who are doing something about it: rising stars in the queer community who are using their influence and fan followings to raise awareness, get people involved, and get out the vote on November 6. This week, Queer Eye's Jonathan Van Ness talks about his issues with both conservatives and liberals, clashes with fellow Queer Eye stars, and how growing up gay among Republicans in the Midwest shaped his perspective. The Advocate: You caused some controversy on Twitter when you suggested the left needs to compromise and support center-left candidates if they want to retake Congress. Social media isn't always the best place to have these conversations — what do you think people missed in that exchange? Van Ness: I don't know, maybe I missed something. First of all, I read this amazing book when I was a vegan (I was a hard-core vegan for like four years in my early 20s) and this book called Yoga and Vegetarianism says that everyone is doing the best they can with what they know. Really, truly, I don't think most people are coming from an evil place. The people who were so mad at me, I don't hold them in a bad regard. It's just unfortunate they had such a hard-core reaction to what I had to say. Also if you’re upset at a tweet I made leave gurl bai! Being able to compromise is what’s missing from both sides of the American political situation & the sooner we all get to a place of mutual understanding the sooner we will get out of this mess. A lot of times when we read things, we take a lot of that stuff as fact, and we don't think critically about what we're reading and what we're digesting. Even myself included, a lot of times when we see certain headlines, it causes a knee-jerk reaction and we start to put labels on whole groups of people, like "all Republicans are racist." That also happens right to left, probably more. People in general are just missing any sort of ability to compromise and really think about what they're reading. But if you look at the numbers, I would have to guess that the number of people who were outraged and [saying] really vitriolic stuff one way or the other about those tweets pales in comparison to the amount of people who were either retweeting in support or liking what I had to say. If 5 percent of people who read a post have a really angry reaction, that makes for those headlines that make it seem like a bigger deal than it really is. You often talk about not demonizing the other side, and at the same time you’ve been very outspoken about your Queer Eye costar Antoni Porowski saying he'd be willing to work with the Masterpiece Cakeshop baker or Karamo Brown having a meeting with Karen Pence's staff. At what point do you say, "It's no longer worth trying to reach out, I need to push back and hold them accountable"? In both those cases, these are very large figureheads who have made very specific attacks on the gay community. The Colorado baker, he may be a good … he's a person who … well, he is a person. But also there's what he represents to the conservative side that does seek to take away rights. Make no mistake, there is definitely a fraction of the [Cato Institute] Republicans that does want to see equal rights taken down and gay marriage overturned and Roe v. Wade overturned. It’s not like I'm blind that there's definitely bad people on the other side, for sure. With Mike Pence, for me it always comes back to (aside from everything about him) that HIV outbreak in 2015 when he was governor of Indiana. Let me Google it before I say it in an interview, stand by ... mmm-hmm … mmm-hmm … right, that's what I remember. So basically he didn't believe in needle exchanges, so he closed all these needle exchanges, and then there was this alarming HIV outbreak in this rural county in Indiana. After he prayed about it, this kind of forced him to level his strong religious beliefs and his moral beliefs with the fact that there was a public health crisis. And watching him talk about it was insane. He was so cold and callous and uneducated. This was long before Trump. I'm just like, bleurgh. There is a difference with a figurehead of a party — or someone like Nicki Minaj, not that you asked — a large figurehead who represents a lot to a lot of people. I do hold them in my mind in a little bit different standards than someone who I meet in a cab or on the show or in the world who I'm meeting face-to-face. It feels different. There is a concern among some liberals that Republicans use Democrats' desire to compromise as a weapon against them — they’ll demand Democrats reach across the aisle and be civil, and then they continue to do whatever they want. How should they push back against that tactic? I guess I would need a more specific example of when they did that. For example, when President Obama was in office and would make a point of compromising on health care reform, and then Republicans would say, "We supported this policy, but now that you endorse it, we're against it." And then they'd go to the media and say he was failing to unite people. Yeah, living in Kansas City, it's been really crazy watching the political advertising. The way that Republicans advertise is so fear-based, and they demonize immigrants so wholeheartedly. It's also so misogynistic, especially in Missouri, the way they talk about Claire McCaskill. It's really troubling the way they use fear in these advertisements to demonize people. I definitely noticed as a gay man from rural America, already being in an oppressed position, I've needed to be the bigger person twice. I also think, with "when they go low, we go high," we need to get kind of nasty and a little bit more real. If 20 percent of people who vote are Tea Party people who really don't want to compromise or see equal rights […] we have to speak to the people who could possibly swing [the vote]. Being in Kansas City filming the next season of Queer Eye, how has that affected your view of all of this? This is not new for me. I'm from four hours due east of here, on the Illinois-Missouri border. I grew up in this region, and the views of people who wholeheartedly support Donald Trump reside in my family. That's why I'm not so scared of it. Like I said, people are doing the best they can with what they know, and political ads come out that say, "They're taking your jobs, they're going to take your guns" — that's literally what the ads say here. I think we need to start refuting with cold hard facts why that's not the case. We do need to fight some of these horrific ads and call them what they are. We need to educate the public, especially in rural America. That's another thing I think we miss, especially on the left in bigger cities: people in rural America are suffering from a more stagnant economy. Technology has left a lot of these people behind, but also there's no one trying to reason with people. They're being demonized. There's no really safe place for people to come together and have a conversation. I think we could all use a dash of compassion, because there is good in most people. We have a lot to worry about, but what is giving you hope and motivation right now? As a little boy in the middle of America, growing up in the age of "don't ask, don't tell" and the Defense of Marriage Act, I never in a million years would have thought that I would have lived in a United States where I would get to be married. I think we've seen times where it's been really bad, [but] there are a lot of really good people working really hard right now. That's what's keeping me going. 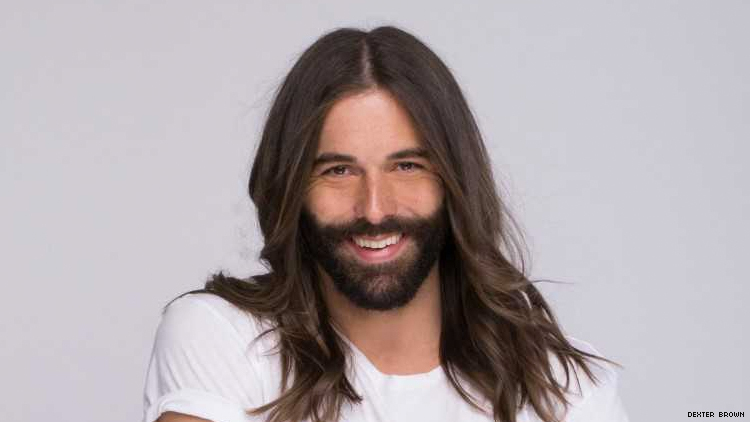 JONATHAN VAN NESS is the grooming expert on Netflix's Emmy-winning series Queer Eye, the star of the Emmy-nominated web series Gay of Thrones, the host of the Getting Curious podcast and a celebrity hairstylist in Los Angeles and New York. You can follow him on Twitter and Instagram.